You all were pretty excited about the Nest of Posies Giveaway. Are you ready to find out who the winner is? 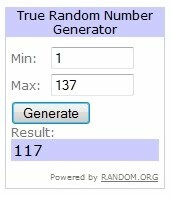 And who was number 117? I know this person will be very excited about winning. She's been wanting one of Kellie's bags for a while. She wants a bag with her blog name on it like mine. She even has a friend with one. ...You can finally get that bag! Monday there will be another giveaway up for grabs! Congrats, Angie! I'm super jealous!